The 2015 Speil Des Jahrs nominee is back with a brand new edition! The Game: On Fire adds even more fun to one of the most addictive games to come out in recent years. 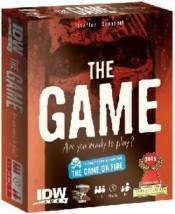 In The Game: On Fire, 1-5 players work together to try and discard 98 cards into 4 different piles while never telling each other exactly which cards they�re holding. Adding fuel to the fun are the new "On Fire" cards, which MUST be played on when they hit the table. If you like the The Game, you�ll love the added challenge The Game: On Fire brings.